Grand Valley State University has the distinction of being among the top institutions for students receiving the Benjamin A. Gilman International Scholarship, as 11 students were granted the award for the 2018-2019 academic year. Granted by the U.S. State Department, the scholarship provides financial assistance for students traveling overseas for internship or study-abroad programs. Paul Villa, one of the students selected for the scholarship, will travel to Spain where he will apply medical skills learned in the classroom this summer. On March 26, dreamer and professor Pamela Harris spoke to Grand Valley State University professors and students about her journey into the United States, discovering her love for mathematics and the people who helped her along the way. Harris has published over 40 research and peer reviewed publications in algebra and other mathematics, has given over 80 research talks and done research with more than 30 undergraduate students. Harris had taught at West Point Military Academy for four years before accepting a position at Williams College. This year marks the 71st annual Cherry Blossom Festival in the nation’s capital, and along with it, the annual Cherry Blossom Princess Princess Program, in which women from all over the country are selected to represent their state. This year, the Michigan representative is none other than Grand Valley State University student Elizabeth Kebler. Kebler, a senior at GVSU with a major in public relations and advertising, got involved with the Cherry Blossom Festival through the National Conference of State Societies (NCSS) and the Michigan State Society. She then went through an application process before being crowned Michigan’s Cherry Blossom Princess. On Tuesday, March 26, Grand Valley State University hosted journalism professor and author Meredith Broussard, an assistant professor at the Arthur L. Carter Journalism Institute at New York University. Broussard was invited to present as a part of the Big Data Initiative, an organization that sponsors training workshops for faculty, brings in speakers from around the country and encourages the development of courses and programs that use data analytics. The initiative was established in 2012 to incorporate data analytics into the university’s curriculum and into faculty scholarship, and has created programs such as digital studies and data science. Tens of thousands of Michiganders flocked to Grand Rapids to attend President Donald Trump’s first “MAGA” Rally of his 2020 campaign. The visit marks Trump’s second rally in Michigan following his victory of the state in the 2016 election. During his address to a packed Van Andel Arena, Trump tailored part of his messaging to Michigan, specifically noting the growth of the automotive industry in the state and the upcoming construction of new Soo Locks, which connects Lake Superior to the Lower Great Lakes. He also delivered “breaking news,” which included a promise to fund the Great Lakes Restoration Initiative. Grand Valley State University’s Campus Interfaith Resources and Muslim Student Association (MSA) held a vigil March 21 beside the Cook Carillon Clocktower to honor the 51 lives lost during the Christchurch, New Zealand terrorist attack nearly a week prior. Students, faculty and community members listened to speakers, held a moment of silence and supported each other through the attack on the Muslim community. MSA President Maisha Sharif said that the lives lost in the attack included Muslims in their vulnerable state of Friday prayer. Grand Valley State University’s student senate voted in favor of withdrawing from the annual Battle of the Valleys fundraising competition against rival university Saginaw Valley. The decision was made during the senate’s March 21 general assembly and will be effective as of Fall 2019. 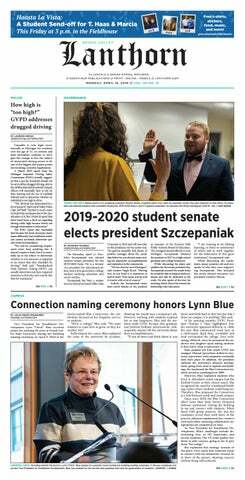 Student senate Vice President of Campus Affairs Carter Engler said that a main reason to drop the fundraising competition was due to the copious amount of time and energy required by an already busy senate. Grand Valley State University’s Department of Movement Science will offer a new, comprehensive dual major option to students beginning Fall 2020; coined a “supermajor” by Associate Professor Ingrid Johnson, this new option will allow students to earn degrees in both Health Education and Physical Education. Students who fulfill requirements for the major will be certified to teach both health and physical education classes from pre-kindergarten through grade 12.